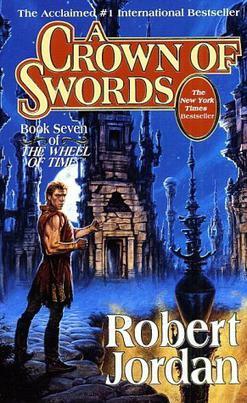 Crown of Swords seems to be one of the not very well thought of books in the Wheel of Time series. If this is true and not a misperception on my part, it is a great disservice to one of the better books in the series. It does have a tighter focus than most of the rest of the series, taking place over the course of something like ten days. It is also the start of a few of the seemingly endless plotlines in that bog down the later part of this series. This is added to the fact that the momentum of the central storyline of Rand’s battle, has been completely sundered by the events of the ending of Lord of Chaos. While the future of plotlines introduced here are not among the series best, their start is well done. The failures of later books, specifically Path of Daggers and Crossroads of Twilight, should not reflect poorly on Crown of Swords. The book starts with some fallout from the last book. Elaida is still imaging her victory in a plan that nearly doomed the world. She is the perfect impediment villain, a person who genuinely believes she is doing the right thing even when she is massively screwing everything up. It also makes her perfectly frustrating to read. Alviarin also plots, though her victory is more genuine since she is playing for the other side. There are also check ins with some of the other losers in the battle at Dumai’s Wells, the Shaido and Gawyn’s Younglings. Both have all that they fought for completely rearranged. The big scene of the prologue is the death of Pedron Niall, Lord Captain Commander of the Children of the Light. While he was at best just a male equivalent of Elaida, Eamon Valda is just what most Whitecloaks seem like, a zealous thug. His taking over the Children is the worst possible thing. Not that is matters much for what he manages to accomplish, but he is one of the most thoroughly awful non-darkfriends in the series. The early chapters here are suitably gruesome. Rand’s fragile coalition that won the pyrrhic victory at Dumai’s Wells sit in the unnatural heat of an endless summers while Rand tromps through piles of corpses. It is an ugly sight. None of the various groups quite trust each other, and all fear that Rand has gone crazy. They are not far wrong. The madness that must eventually consume him has begun to do so. Up until this point Rand has been constantly moving forward to his goals. He has had failures and trials, but nothing has long put him off his goals of uniting the world to face the last battle. After Dumai’s Wells, he is in retreat. It doesn’t help that he has sent off most of his trusted allies. We are also introduced to the interminable plotline for Perrin. He flat out says that the only thing that matters to him is Faile, not Tarmon Gaidon. While this is romantic, it is also terrible. He has to learn the there are things that are more important. There are also his constant attempts to protect her that end up seeming to ignore her contributions while also emphasizing Berelain’s, which enrages Faile even though Perrin is nearly oblivious to their rivalry over him. Perrin’s trials with Faile happen while Rand tries to split the Gordian knot that is the situation with Colavaere, who has proclaimed herself Queen in his absence. He cannot let himself kill her due to his personal hang-ups, but according to the law she must be killed. He finds a way that should be satisfactory, and send the appropriate message to the scheming nobles of Cairhien. Too bad she takes the easy way out. Then there is Egwene’s struggle to become the Amyrlin Seat they named her in the last book. The Aes Sedai refuse to be anything but incompetent, though later revelations make some of their actions make more sense. Still, Egwene is building strength, while also generally doing things right. Interestingly, none of her allies are traditional Aes Sedai. Siuan and Leane were, then weren’t and now are again while Faolain and Theodrin are not quite. Aes Sedai have a blind spot when it comes to anyone that falls out of the usual Aes Sedai power structure, even when they only barely do so. She is able to use their slight knowledge of her supposed allies various schemes to make them her actual allies, even if she coerce and blackmail them into it. The last story introduced is also the best, defining plotline of Crown of Swords, that of the dueling search for the Bowl of the Winds. Mat is there to help, but they do their best to ignore him, all while dealing with the numerous dangers of Ebou Dar. The success of this story is largely due to the number of “fun” characters there. Nynaeve and Mat are easily the two most entertaining characters in the series, and Thom is always fun. The rest of the crew there just makes it more fun. I especially like Elayne finding out just why Rand keeps a supposed lout like Mat around. For the first half of the book, it is just the girls failed search attempts and their successful attempts to ignore Mat, while he tries to stay busy/not stabbed. Perrin’s story in this volume is cut short, as he is soon sent away to gather the Prophet and Ghealdon for Rand, and just to keep it infuriating, he sends Berelain along as well. Rand also finally consummates his relationship with Min, though he feels guilty about it. Those two things combined put Rand in a funk, that is pretty much his problem. His mind is not right after his capture, and he is both less trusting than he was before and more eager to send his friends away to keep them safe. After hashing things out with Min, he goes far the opposite way, becoming almost giddy. His quick change from one mood to another is not normal. But is it useful, as he gets the important parts of a bargain with the Seafolk done that will be of use to him. He then pushes his luck by going after the rebels in the countryside. This works out well at first, gaining him tenous allies in two of the three leaders, but also out there is Padan Fain and eventually a bubble of evil. Rand is saved only by the timely intervention of Cadsuane and her crew of Aes Sedai. Cadsuane is an interesting mid-series addition. She is infuriating and almost always pushes the wrong buttons when it comes to Rand, but she is also one of the few Aes Sedai that is actually trying to help his cause and not furthering some other goal. While she does help out some, her help towards Rands goals is grudging and her supposedly helpful attempts rarely seem to do any good. She is Moiraine without the trust Rand had in her. In Ebou Dar, the girls realize they need Mat’s help, and he is forcibly moved into the Palace. They also find the Kin, the secret group of Tower failures that the Aes Sedai use to catch runaways. Mat has encounters with Queen Tylin that reverse gender dynamics of the usual ruler and consort story. Despite the usual attempts of the Black Ajah and forsaken, they find the Bowl and most escape the city just before the Seanchan come back. What Crown of Swords most has going for it are big exciting scenes. The stories are small and the focus is tight, but a lot of cool things happen in this book. There is Mat realizing who Birgitte is, Mat fighting the Gholam over the wounded Elayne, Rand swordfighting Toram Riatin, Lan saving Nynaeve just before she drowns, the foggy bubble of evil. This book is just packed with cool scenes. And it ends with Rand fighting Sammael in the ruins of Shadar Logoth. Also, for a book that covers little time, many big events are covered. Niall is killed. Elaida loses her power. Morgase formally gives up the crown of Andor, and the Shaido are scattered across the West. It is a world changing book, with status quos changing all the time. The world of the first half of the series is gone, and the new reality must be dealt with. Crown of Swords may not be the biggest book or have the most important scenes in the series, but it has a large number of events of medium importance. This books serves as the set up for the next four or so books, for better or worse. The loss of Rand’s leaping forward progress makes many of the later books, starting with this one, seem aimless. That criticism isn’t wrong, but it misses the point. Rand’s quest feels like it has been derailed because it has been. Like the author, Rand is getting bogged down in the nitty gritty. Still, Crown of Swords is a fine entry in the series.